Dogs trained at the Spectrum have worked with major movie stars like Tom Selleck and Jackie Chan who have applauded the work Lori has done with the dogs. Last year was a very busy year for Lori as she worked on two major television series. She trained Tonka, an Australian Shepherd, for his role as Jack in the 2004 remake of the ever popular "Little House on the Prairie". In the three 2-hour episodes, which aired on TV earlier this spring, Jack was the faithful companion of the Ingalls family and traveled alongside their covered wagon, accompanied the Ingalls girls on adventures in the woods, and protected their cabin against intruders. All these behaviors were accomplished through Lori's diligent training and professional handling on set. Much goes into the preparation for the scenes that are finally part of a feature film or a television series...first off, the right dog must be found. Lori doesn't always use her own dogs; often she looks for dogs from the Spectrum training classes to find just the right dog with the "look" that the producer wants. Sometimes double (or look-alike) dogs are used...all dogs must be trained in basic behaviors like "back", "head down", "go to mark", and "with friend"...specific sequences must be taught...sometimes make-up is applied to ensure each dog is a perfect copy of the other...and scenes must be shot over & over until the perfection you see on screen is achieved. You can prepare your dog for the possibility of a future audition by teaching him basic manners, ensuring he knows all the common commands like "come", "sit", "down", "stay", and "wait". Be sure to socialize him to all the people, sights and sounds he will encounter in his world and not only will he be a wonderful pet, but he will be prepared in case he ever gets "the call". You just never know what sort of dog the next producer, shooting in the Calgary area, might be searching for...it might be just the type of dog that is lying on your couch right now! THE SUPERDOGS never fail to cause poochmania wherever they go! Trained to run and jump at incredible speeds, and to jump to unbelievable heights, the achievements of the SUPERDOGS are truly astonishing! They're great athletes... they're great entertainers...they're great dogs. Most of all they're the great friends and family pets of over 250 amateur trainers who star in the many Superdog Shows across Canada and the USA every year. The SUPERDOGS are incredibly smart...and are sometimes independent thinkers... you can never predict the spontaneous reactions of these clever performers. The dogs in the show represent nearly every breed and mixed breed imaginable and Herb Williams, the genius behind the popular Superdog Show, is proud to say that almost 40% of all SUPERDOGS have been rescued from shelters across North America. They have become the world's most popular dogs and there are several regular SUPERDOG team members who call the Superdog Spectrum home. On this year's tour, you'll see dogs owned and trained by Lori Boyle (owner of the Spectrum), Shannen Jorgensen (Agility Instructor), Sherry Etifier (Instructor of puppy classes), Dona Robbins (class assistant), Kari Kerr (class assistant), Tracy Garnett (class assistant), Julie Delarue (Dog DayCare assistant), Megan Campbell, Paul Aziz, and Bob Mjolsness. At this year's Calgary Stampede, along with the regular team members from across the continent, some new graduates of Superdog Spectrum classes will have an opportunity to perform in the show too! Rae-Lynn Duffield with Oreo & Twix, Rachael Jesse with Tennis, Connie Susut with Nikki, Kathleen Douglas-England with Tequila, Lisa Pichurski with Grasshopper, Ian Munroe with Dugal and Candy Villett with Zoe will all be making guest appearances. Yes, inside the heart of every dog is a Superdog & it just takes a lot of love, patience, and training to make it shine. No matter how famous they become, The SUPERDOGS always retain the ability to touch the hearts of their inter-generational audience, from puppies to grandpaws. Agility is a sport in which a handler is given a set amount of time in which to direct his dog, off-leash, through an intricate obstacle course. Originally it was loosely modeled on equestrian jumping competitions, then the sport evolved using its own additional obstacles, scoring systems, and performance ideals. 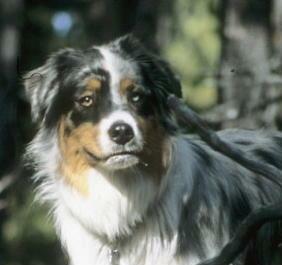 Agility as we know it, made its debut in 1979 and has since become the most rapidly growing dog sport. Superdog Spectrum offers an Agility Training Program to help owners and their dogs master the ins and outs (and ups, downs, and arounds) of agility training & competition. This specialty program starts with a class for puppies...the Puppy Gymnastics Class...and upon graduation the puppy can progress through a series of classes to a Master Athlete/Advanced level. Shannen Jorgensen, who is a long-time trainer at Superdog Spectrum, is the instructor for these classes. Shannon and her Papillions have won many prestigious titles & awards in Agility competitions and she has attended several Agility Training Camps in the US, obtaining her Masters Coaching Level Certification in Agility. Using tunnels, jumps, weave poles, a dog walk, a teeter, and an A-frame, Shannen challenges the dogs and the handlers to be the best they can possibly be. So if you think Agility sounds exciting, come by and watch our Tuesday night classes and see for yourself the kind of fun and excitement you could have with your dog! Shannen Jorgensen, one of Canada's most popular agility instructors, stresses solid handling fundamentals and positive training techniques. Superdog Spectrum is proud to have an Agility Instructor of Shannen's caliber teaching our classes and seminars! Good job Paws 'n Effect handlers! The Spectrum is proud of you all! A dog's life sure isn't what it used to be. In the past, there was nearly always someone at home who needed a dog to work or play with. Life was entertaining for dogs in those bygone days, and exercise was abundant. Now, most dog owners go off to work for eight or more hours every day, while their latchkey dogs wait at home for them, alone and not always patient. Chewing, digging, and excessive barking are common misbehaviors that arise when a dog is left by herself all day. Insufficient exercise, mental & physical activity, and lack of attention are the main reasons for these unpleasant home-alone habits. Unfortunately, many hardworking owners don't have the time every day to keep a dog...especially a young one...occupied. At Superdog Spectrum Dog DayCare, we provide dog owners with peace of mind knowing that their dog well cared for and that he is doing what dogs do best...being social. 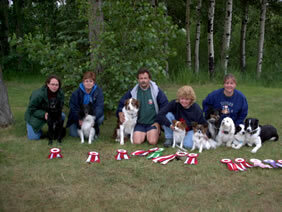 Our Dog DayCare programs are designed to restore, improve or maintain your dog's social skills. While it appears that the dogs in the Dog DayCare playroom are just hanging out, they are actually learning doggy manners such as "bite inhibition", and they instinctively practice using "calming signals" with each other. It is a well known fact that a well-socialized pup will become a happy, confident dog so Dog DayCare is one way to provide your dog with the daily stimulation that he requires. What's Happening in SUPERDog DayCare? Sam, one of our very first Dog DayCare friends, is now the "resident Office Weimaraner" due to being sidelined with a broken leg. Sam's accident occurred one evening when his leg slipped into a gopher hole while running through the off-leash park with his dad. After 2 surgeries, the poor guy is sporting a large, very cumbersome cast on his left front leg. We're all rooting for Sam to have a speedy recovery so he can go back to chasing gophers and thoroughly enjoy his summer! JUNE HIGHLIGHTS - Sawyer, the white German Shepherd puppy, started coming to Superdog Dog DayCare in April this year. His mom knew she had to socialize him with both humans and dogs as he was very timid and leery of strangers. After only 3 months in SuperDog DayCare, Sawyer's confidence and social skills have improved in leaps and bounds! He and his "partner in crime", Findlay, enjoy hosting pool parties at the water bucket on a regular basis! Sawyer just graduated from Puppy All-star Class and he and his parents are now completing the Superdog Spectrum's unique Canine Communication Class. CONGRATULATIONS SAWYER...Now that's "PAWSITIVE PROGRESS"! What a rewarding and successful 18 months it's been since the introduction of the Canine Communication Class to the Superdog Spectrum Training Program. Communication barriers are the number one reason for breakdowns in any relationship and it has been a wonderful experience for Tylene Hay to facilitate the opening of the lines of communication between human and canine. In the Canine Communication Class, the owner learns to communicate by creating a bond with his dog that soon leads to trust. Through learning to read and interpret his dog's language, an owner finally understands why his dog is doing the things he's doing, and suddenly there's a "light bulb moment" in the relationship. Someone once said, the opposite of fear is trust, therefore, if your dog learns to trust you, he will have no fears. Hector (Newfoundland) was showing aggressive tendencies towards other dogs in the park. After 6 weeks, Hector is able to play off-leash, listens when he is called away from a situation that may be troublesome (his "mom" learned to interpret dog language to avoid a volatile situation before it starts), and approaches and greets other canines appropriately. Crowbar (white Shepard) was fearful and guarded with strangers, and he was unable to be left alone for any length of time. After graduating from Canine Communication he was able to be approached by strangers with food. He then spent 2-3 days of the week at our Dog Dog DayCare to continue socializing with humans and dogs. Nero (Bouvier) was out of control. He had no focus on his human, making walks very unpleasant. After just a few weeks in the Canine Communication Class, his "dad" started to see huge improvements in Nero's attitude. He became more focused, less unruly, and walks were getting easier. After the 6 week Canine Communication Class, Nero is attentive to his human and listens while on walks. Montana (GSD) would lunge out and bark aggressively at strangers...she was easily frightened and reacted accordingly. Within 6 weeks, "mom" had created a bond with Montana and she was no longer reacting to her fear. Montana learned to trust her human and even cautiously approaches strangers allowing them to greet her.